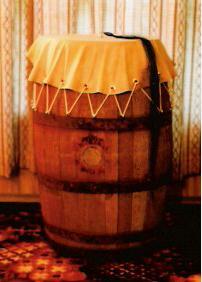 The Brummtopp is a European friction drum also known as Brommtopf, Reibtrommel, Rummelpot, and in classical music circles is also known as a "lion's roar". The rummeling sound of the drum is created by rubbing the horsehair swatch attached to the skinhead of the drum with wet hands. Listen. In Russian Mennonite folk tradition, the Brummtopp is played by groups of young men in costume on New Year's Eve as they go from house to house in the village singing a song of well wishes for the new year. The rummeling sound is meant to be somewhat frightening or at least annoying enough to have the "hosts" provide these "mummers" with treats, drinks, or even money. Tales are told of the young men holding the drum against the door in order to set the entire house avibrating.